Richard Williams has been the Artistic Director of the Berlin Jazzfest for the past three years; 2017 is his last year and I wanted to make up for missing the first two. So, picking up tickets for three performances (the rest were sold out) and buying seats on three trains, I packed my poor knowledge of contemporary jazz and a small bag and headed to Berlin. My introduction to the festival was the artist-in-residence’s Trio, with Cory Smythe on piano, and Chris Tordini on bass. Sorey prowled around a small city’s worth of percussive devices and instruments (including a drum kit, a parade drum, vibes, keyboards and a large gong) accentuating the music at one moment, driving it the next. It was impressive but I didn’t feel entirely engaged. The World Service producer and presenter, with her longstanding band, played her recent album of songs about living in Brazil under the military government, The Sao Paulo Tapes. 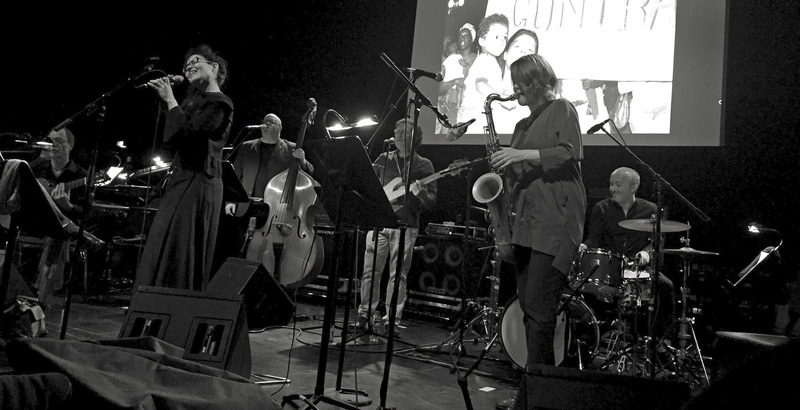 Produced by Robert Wyatt and featuring songs written by some of Brazil’s greatest, the projected backdrop of photographs from that period added an unsettling element to her midnight set in a theatre space off the main concert hall. Her warm, lovely voice sat on a fantastic bed of bossa rhythms, expertly played. With two basses (double and electric), great guitar from Ife Tolentino and Ingrid Laubrock’s sax to the fore, it was a perfect jewel-like performance. During a fantastic suite of music commissioned for the festival, based on the four songs that Mattie Mae Thomas left the world when she was recorded in Parchman Farm in 1939, guitarist Marvin Sewell played an achingly moving blues, intense and soulful. His buzzing slide sounded like the grooves of a 78 come to life, before he switched back to playing the oldest pattern of the blues, setting up a throbbing pulse as Mattie Mae’s voice ghosted into the tune, sampled, cut up and looped. At the same time, vocalist Dean Bowman worked around and off her performance. As it developed, composer and trumpeter Ambrose Akinmusire stepped in, his beautifully burnished tone pulling the music from the farm to the city with a moody five-note melody that sounded angular and sophisticated in contrast. The music built and built on the piano and trumpet until Sewell came back in to match Akinmusire’s explorations, sounding almost like Larry Carlton with Steely Dan. The band’s groove stayed strong, never losing sight of Mississippi, even as the guitar and trumpet played like cat-and-mouse over the top. It was astonishing to think that they had played this piece only once before, at their rehearsal together the previous day. “How in the pocket was that!” Richard exclaimed at the concert’s end, his first tentative thoughts of Ambrose using Mattie Mae Thomas as a starting point triumphantly realised. To the Maison de France for a showing of Ascenseur pour l’échafaud, Louis Malle’s first film, which famously has a Miles Davis soundtrack. The last surviving musician from the band that recorded it, René Urtreger, gave a solo recital after the screening. His talent was barely dimmed by the passing years. He had become a pop arranger for Claude François and a film composer for Claud Berri before returning to his first love, jazz, in the late 70s. Nels Cline is a master of so many guitar genres it’s dizzying. Quite a few (even the rock ones) were on display here, as he played his album of standards and oddities (like Henry Mancini’s “The Search for Cat” – a short cue from the Breakfast at Tiffany’s score and Sonic Youth’s “Snare Girl”). Conductor and arranger Michael Leonhart guided the brilliant chamber orchestra, partly made up of talented German music students – there was even a harp, always great to see. Moving from the noir of New York to the bleached-out tones of sunny California, Nels altered his style in response to the songs. Not one of nature’s front-men, he remained mostly seated behind a workbench covered in pedals and boxes and a lap steel (used to wonderful theramin-like effect on “I Have Dreamed” and “Why was I Born?”). From the naggingly beautiful blues of Jimmy Guiffre’s “Cry, Want” to the dissonance of Annette Peacock’s “So Hard it Hurts/Touching” this was a shape-shifting treat. And the last song, “The Bond”, a simple melodic riff that built into a hypnotic, sweeping soundscape, may just have been the best. If Nels was the heart, Lonnie must be the soul, and it does your own soul good to watch him, a man so in command of his oeuvre (the funky Hammond writ large) that the audience is at one with him from the off. Looking for all the world like Zoltar the Fortune Teller in Tom Hanks’ Big, he lets out a howl of joy as he comes across some amusingly cheesy melody or plays a lick that he really likes. The Leslie speaker behind him was a throbbing, whirling presence of its own, and he worked his way through a barnstorming and crowd-pleasing set, his pedal bass-playing locked tight into Johnathan Blake’s hyper-attuned drumming. The guitar of Jonathan Kreisberg, who covered the bases from Wes Montgomery to James Brown, was the icing on the cake. What a great place to end my Berlin adventure. I’d heard wailing improvisations, hushed, subtle orchestrations, blistering musical conversations and glorious melodies. The silence of Berlin on the Sunday morning after the Saturday night made it all seem dreamlike – the result of seeing ten concerts in 55 hours, perhaps. Whatever, it was fantastic to be immersed in such a creative space for such an intense period, and to see so many great collaborations work across boundaries of geography, race, language and culture.